Lip Gloss Equals Skin Cancer?! Lip Gloss Can Invite Skin Cancer. Hmmm. Are you buying it? Some dermatologists have come out with that very warning. And yet, no studies have actually confirmed the lip gloss-skin cancer link. It's a theory, but many derms feel it's a strong theory. How could this be? According to NYC dermatologist, Dr. Bruce Robinson, it's the moisture in the gloss that attracts the sun's harmful rays. "Take a magifying glass and put it over your lips." When you apply shiny lip gloss and go out into the sun, "that's essentially what you're doing." The shiny gloss can actually raise your risk of developing skin cancer. At least that is what some skin experts are saying. So what's a gal to do? Dump your lip gloss and wear lipstick. Or layer a lip balm with an SPF of 30 under your gloss. Try Chapstick's Ultra30. Or just wear a lip balm with a high SPF. Don't go out in the sun with bare, naked lips. If you wear lip gloss, are you worried it will raise your risk of skin cancer or cause other lip problems? 48% No, not enough to change my ways. 35% A little. I'll try to make sure mine has SPF. 17% Yes! Shiny lips aren't worth the risk of having no lips! In case anyone's wondering, I voted with the 48% majority. NARS Cosmetics makes some of the prettiest and sexiest lip glosses around. Just ask Hollywood beauty and E channel star, Kim Kardashian, about NARS. 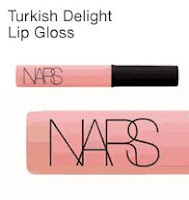 She told us that NARS Lip Gloss in 'Turkish Delight,' is the one beauty item she could not live without (24.00 a tube). Turkish Delight is a soft, Pink Sorbet hue. Perfect with daytime bronzed skin or complimentary to a smokey eye look. Turkish Delight is a cult favorite at NARS, and once again, is currently out of stock. Oops! My Hair Is Too Dark!!! You've heard of this one: Color Oops. It's a hair color corrector, and In Style Magazine calls Oops, one of its beauty breakthroughs for 2008. What Color Oops can do, at just $12.99 a bottle at drugstores like Walgreens, is lift the color dye errors you have made. For instance, if you've dyed your light brown hair a shade of deep chocolate brown, and it isn't attractive to you, try Oops. This product is said to perform near miracles on darker dyes. It might not lift your Cleopatra black tresses completely, but, you will be able to lift your hair a few shades lighter. Now if you dyed your hair platinum, well, Color Oops can not help you there. That initial process has involved bleaching, and the reverse coloring cannot be accomplished with this method. The beauty of Oops is its gentle formula. It's bleach and ammonia free. You apply it to your hair, and after 20 minutes, you rinse away your dark dye molecules. Some women claim Oops works best on newly colored hair mistakes. If you have dark dye in your hair from years ago, well, it might not lift as many shades as you would like. Still, the stuff is worth trying, especially if you're sitting there with orange and brown clown hair and crying your eyes out. Please, follow directions to a "T." And as the experts all advise, please do a strand test. It sure is popular. MaMa Lotion has been the top seller for two years now at skincarerx.com. What exactly is MaMa Lotion? It is simply an AHA in skin talk, or an alpha hydroxy acid formula. It's main job is to exfoliate and moisturize skin. The 'MaMa' means mandelic acid and malic acid gel. Many women and men swear by MaMa Lotion. It is formulated to get rid of acne and breakouts, to even skin tone, to tighten skin and pores, to reduce fine lines, and even reduce the symptoms of Rosacea. MaMa Lotion ($44.50 for 1.67 fl.oz) can be found at internet retail stores like http://www.skincarerx.com/. (See Ad to right of article). The lotion is actually in the texture of a gel. MaMa is said to be wonderful for all skin types and skin colors. The lotion works like Retin-A, in the sense that it takes a serious attack on damaged skin like wrinkles, acne, and large pores, and is worn as a nighttime treatment, But the makers of MaMa Lotion, MCK Labs, claim that the formula is much easier on the skin than Retin-A. Retin-A can cause redness, swelling, itchiness, and peeling when overused. When you first apply MaMa Lotion on your face, you will note its sticky texture. And it can sting for the first 40 seconds. But after it is absorbed into the skin, it dries nicely and skin feels very smooth. To read testimonial after testimonial on the beauty of MaMa Lotion, check out skincarerx.com. We all want hair that is shiny and smooth. For years now, the only true way to achieve that level of glossiness and texture, was a trip to the hair salon with a high-end glazing process. The experts at John Freida have developed a new treatment that promises salon-quality glaze at a very reasonable price. And all it takes is three minutes in the shower to turn lifeless, dull locks into mega-watt shine! It's called John Freida's Luminous Color Glaze ($8.97). In four beautiful ways to glaze: Clear Shine, Sheer Blonde Color Glaze, Brilliant Brunette Color Glaze, and Radiant Red Color Glaze. So simple to use, too. Just hop in the shower and after shampooing, squeeze out excess water. Apply the Clear Shine Gloss through your wet hair, from root to ends. Leave on for three minutes, then rinse. Style as usual. The result is hair that has that mirror-like shine. Damaged locks have 'filled in' and the texture is silky and smooth. Want to add some vibrant color with that high-power shine? Try the color-enhancing shades of Luminous Color Glaze. You will get a gradual boost of color. After 6-8 daily uses, you haircolor will see more and more richness and depth. 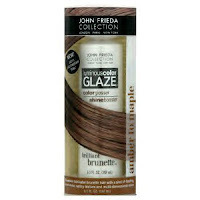 The good news: John Freida's glazing treatments are very kind and gentle to your hair. No ammonia. No peroxide. 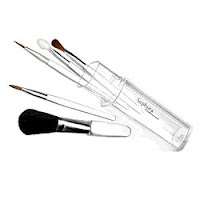 This is a super deal for a tiny price: The Sephora Mini Brush Set. Just $6.00!! How cute is that?! Every gal who wears makeup should have a set of makeup brushes. Okay, I'll admit, I haven't always known exactly which brush was for what part of the face. But with the Sephora Mini Brush Set, you're getting the basics. And it really isn't too hard to figure out. First of all, the five smooth, professional-quality brushes are very convenient to tote around. They measure a small 3 3/4 inches long. The brushes come neatly packaged in a clear Sephora signature cannister. This brush set will easily fit inside a very small makeup bag. You get a mini goat hair blush brush and an eyeshadow brush made of goat hair. You also get a pony hair eyeliner brush and a lip brush made of pony hair. Lastly, you get an eyeshadow applicator made of US scott 110ppi foam. You probably couldn't even make this mini brush set for $6. Why not get it from the pros at www.Sephora.com. Better hurry, because this little brush set has been sold out several times now. A product that gets rid of beach sand quickly and effectively. Without using water. Now why couldn't I think of that? Darn. Surfer's Secret Sand Eliminator. A bottle will last you all summer. You can't hate this product. With it being 'Green Week,' this is an excellent item to promote. First of all, it's safe for everyone and biodegradable. It's made of soothing and natural things like: cornstarch, grapeseed oil, and aloe vera. Plus, it's wonderful for the whole family. Sand in the diaper? No problem. Sand in your bikini? No problem. Sand all over your feet, and you're about to step into your new Mercedes? No problem at all. This product rocks, dude, and yeah, surfers love the stuff. Surfer's Secret Sand Eliminator comes in two sizes--- a 1.5 oz bottle for $3.50, and a 6 oz. bottle for $7.00. Even the price is right. So how does it work? All you need to do is squeeze a quarter-size amount into your hand and wipe it over the area caked with sand. Or you can apply it on a towel and wipe. The sand just glides off. Amazing. And you're left with smooth skin, thanks to the grapeseed and aloe moisturizing benefits. Be sand free this summer. The stuff even wipes away grass clippings, hair clippings, and more. Visit http://www.surferssecrets.com/ for more information. How many makeup or cosmetics bags do you own? And what if I told you, you could design your own makeup bag at http://www.annawilliam.com/. Look, I've got about five or more makeup bags. A couple are from Victoria's Secret, and the others are from department and drug stores. The cosmetics bags I own are not pretty enough, and certainly, are not roomy enough. I guess I pack a lot of tools. High maintenance. And no, I cannot live without a makeup bag. Anna William is a home and handbag boutique nestled in the bustling, seaside community of Newburyport, Massachusetts. There, you can design or 'build' your own makeup/cosmetics bag. The family-owned store offers many gorgeous fabrics to choose from. For $39.00, you can design your own large cosmetics bag that comes with a zipper. And for $79.00, you can build your own spacious, travel cosmetics bag. Both styles offer plenty of room inside, especially for those bigger makeup items. The large cosmetics bag is 8 1/2" wide x 5 3/4" tall. The travel cosmetics bag measures 11" wide x 8 1/4" tall x 6" deep. 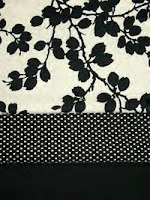 I designed my own makeup bag in the sophisticated 'City Chic Collection,' using black and ivory colors (see photo). How beautiful is that? For more information, check out annawilliam.com. You'll get lost in all the beautiful fabrics, and end up with a most unique and useful makeup bag.